Solid state drives offer much higher data transfer rates than traditional hard drives and consume less energy. For anyone thinking of adding an SSD to a personal computer that uses the SATA drive interface, the Samsung 850 EVO series offers some of the best performance outside of professional class drives. They may cost a little more than other consumer drives, but the performance and warranty are worth the price. Purchase the Samsung 850 EVO from Amazon. Samsung 850 EVO series offers excellent performance from SATA interface. Its thin profile allows it to be used in many laptops or stacked in desktops. Drive carries an excellent warranty. It is more expensive than many similar SATA class drives. Samsung is one of the biggest names when it comes to solid-state storage. While most other companies have to buy components such as controllers and NAND memory chips from various suppliers, Samsung produces everything itself. This gives Samsung a distinct advantage in several ways and makes the company stand out among a sea of available drive manufacturers. The 850 EVO uses the 3D V-NAND technology that gives it a higher data density than many other drives and provides it with a slight advantage in performance. This 2.5-inch drive has an extremely slim 7mm profile that allows it to slide into a wide range of laptops that happen to have thin profiles. The drive is thin enough to stack several of them in a desktop system. The 500 GB version of the drive is affordable, but it still provides a good amount of storage space, which makes it functional as a stand-alone drive. The drive runs on the SATA interface, which makes this an attractive option for anyone who is looking to upgrade an older desktop or laptop computer from a traditional hard drive to an SSD to give their system a much-needed performance boost. So how well does this perform in real-world usage? In terms of the sequential tests the companies like to advertise, the drive delivered 521.7 MB/s for reads and 505.1 MB/s for writes in tests, which is better than many other consumer SATA drives. 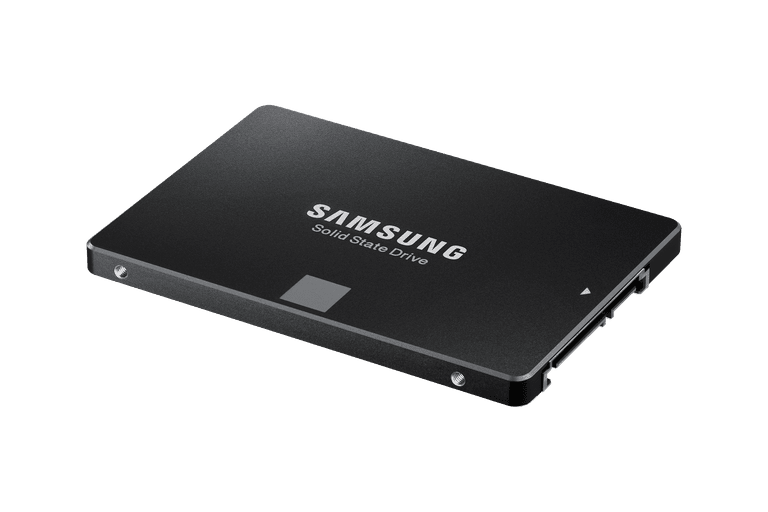 Samsung also offers its 850 Pro and other SSD drives that provide better performance when dealing with IO-intensive applications, but they cost a good deal more for the same level of capacity. As for security, the 850 EVO supports both the AES 256 and Opal 2.0 encryption methods to keep your data secure while not impacting performance dramatically. This is a key feature for many business users who are concerned about security with their laptop computers. It is also a feature set that is missing from many low-cost SSD options. One of the best things about Samsung's drives is their reliability and warranty. They have some of the best overall reliability rates when it comes to failures in SSDs, which are already quite uncommon. To back this up, the company provides a five-year warranty on the drive. It should be noted that the company also rates it at 150TB of writes to the drive. Pricing for the drive is $100 less than its initial price at release. This puts it at about $0.30/GB, which is above average for consumer class drives in this capacity range, and Samsung comes with higher performance and better warranty which is something to keep in mind. 500 GB not big enough for you? Samsung manufactures the 850 EVO SATA solid state drive in sizes up to 4 TB.